Captain Hawrelak gripped the armrests of the U.S.S. Edmonton's command throne with white-knuckled fingers. "Romulans!" he barked. "And they're targeting the ambassador's shuttle! The butchers!" G'gnarly, the Edmonton's Tellarite first officer, scowled. "Red alert. Raise shields, ready all weapons," he ordered, choosing to interpret his commanding officer's remarks as an order to go to battle stations. "Encounter reports she's gone to Red Alert," said Lieutenant Trombone, the helmsman and second officer. On the main viewer the sleek, hawk-like Romulan cruisers swooped like birds of prey, lunging for the damaged, practically defenceless shuttle. That metaphor's a little too apt - or perhaps raptor - for my liking, punned Captain Hawrelak silently. Meanwhile, aboard the U.S.S. Encounter, Captain Wolverine clenched his already-stressed teeth in an agitated grimace. "That fool Hawrelak is bringing us in too fast," he muttered. 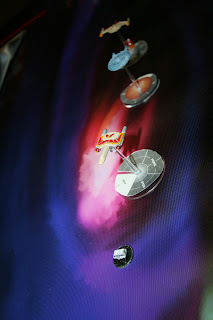 "We have to stay out of range of those plasma torpedoes!" The Romulan destroyer, Skyhawk-class, bore down on the shuttle, pushing her engines to the limit. Wolverine watched in horror as the impetuous Hawrelak took the bait, chasing the Skyhawk down, leaving the Encounter no choice but to follow. And as Wolverine anticipated, the heavier Romulan Battle Hawk-class cruiser hove in from behind, her plasma cannons glowing as they charged up. "Lieutenant Slendercaaf, signal the Edmonton to put some distance between us and that cruiser!" barked Wolverine. Slendercaaf nodded, one hand touching her earpiece, but it was too late. Aboard the shuttlecraft, Fox and Gomez watched in horror as the Romulan cruiser spat forth a deadly gob of swirling orange plasma straight up the nacelles of the Edmonton. The Federation cruiser lurched, shields collapsing in a helpless flare of dissipating gluons and anti-neutrinos, her hull scorched. "This is some rescue," muttered Fox. Gomez could only swallow glumly. "For the love of--!" sputtered Captain Wolverine aboard Encounter as he watched the Edmonton founder. A salvo of Romulan phaser fire lanced across the stricken vessel's stern, sending precious hull plating careening across the nebula. "FIRE EVERYTHING!" he screamed, and the Encounter's weapons hurled their fury across the void, splashing across the destroyer's shields, then raking the cruiser with photon torpedoes. It was little use. Another pair of plasma torpedoes almost casually reached out to envelop the Edmonton, and then the cruiser simply vanished. Aboard the shuttlecraft Gomez and Fox hung on to their seats as the Romulan destroyer bore down upon them, backlit by the explosion of the Edmonton. Gomez fired the shuttle's puny point-defence phaser turret, but the Romulan didn't even slow down, merely reached out with beams of deadly green light to burn across the shuttle's roof. The control panel in front of fox began to spit and spark dangerously, on its way to overload. "Look out, sir--YEARRRGHHHHHHHH!" cried Gomez as he leapt between the console and the startled ambassador just as it exploded in a shower of lethal sparks. The mortally wounded redshirt slumped backward across Fox's lap, coughing, gasping. "Wh-why can't they p-put fuses aboard these damn ships..!" groaned Gomez with his last mortal breath. Captain Wolverine knew his position was hopeless. "All nonessential personnel to the escape pods," he said to Lieutenant Slendercaaf, who gave the order and then, sheepishly, left the bridge to find a pod of her own. Valiantly Captain Wolverine released another volley of photons and phasers at the lead Skyhawk, heavily damaging the Romulan destroyer, but not before he watched the ambassador's shuttlecraft flare like a campfire doused in lighter fluid. "That tears it," he said as the other Romulan ship's phasers lashed out at the Encounter from behind. He slammed his fist down on the emergency intercom built into his command chair. "All hands abandon ship! All hands abandon ship!" Then his thumb slid down to the "EJECT POD" button. 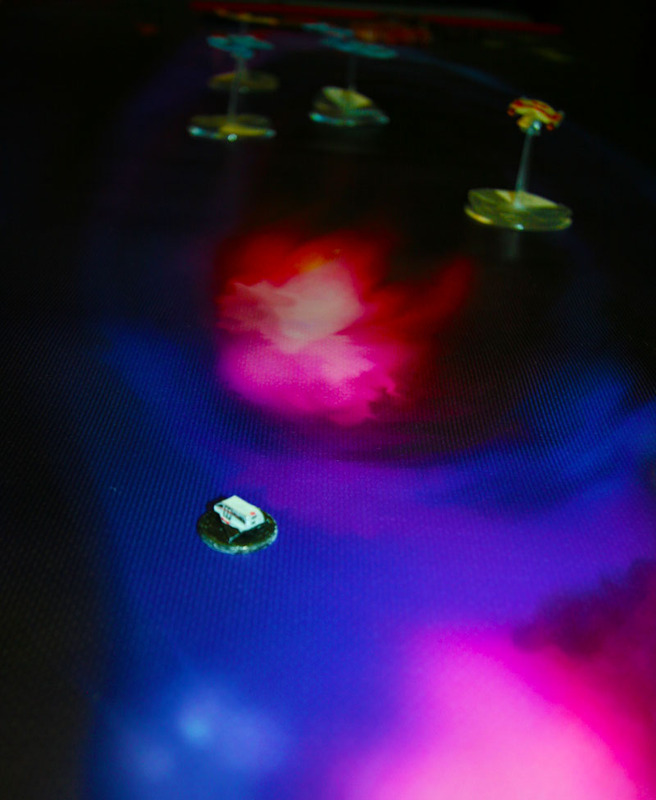 In an instant, curved metal sheets slid from the base of the command chair to form a sphere around it, encasing the captain in a fragile bubble of life. An instant after that, the ship's bridge dome flipped open and the pressure of escaping oxygen blew Captain Wolverine's lifepod through the opening. The Encounter was blown to fragments only seconds later. Captain Wolverine had to admit that he at least had a fantastic view of his ship's destruction. He waited for a few long moments, wondering if the Romulans were feeling vindictive enough today to kill the vulnerable survivors, floating about in lifepods like his own. But soon the two victorious Romulans wheeled about and headed back for their side of the Neutral Zone, leaving floating bodies and debris in their wake. Captain Wolverine knew that he'd probably never understand why so many had died here today. He sent out a distress call and leaned back in his chair to meditate. A few kilometres distant, Ambassador Fox's charred corpse pinwheeled through the cosmos, the data jewel in his pocket nothing more than a blackened cinder now, the recipe for bootleg Romulan Ale wiped by phaser and plasma radiation from its memory crystals. Nebula starfield map painted by Jeff Shyluk. 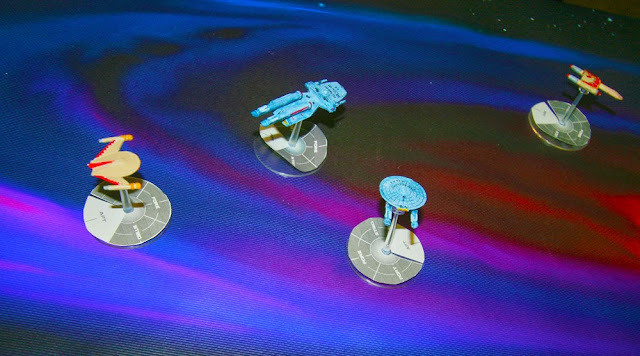 Romulan ships painted by Sean Woods. 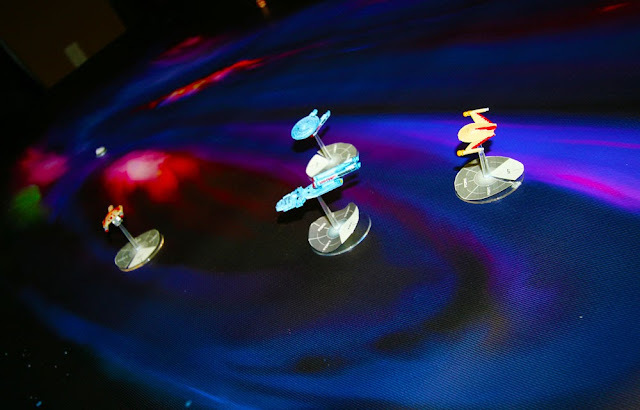 Federation ships painted by Earl J. Woods. Not... Captain Julius Wolverine...? Maybe his brother, Sam? "Sigil of the Sky People"
Mike and Mandy Married at the Muttart!